Last year, one of our internships was teaching the students of Room 208, high school graduates with special learning needs. Part of our job was to work with the students to create a skit which we then performed in a brown bag for the school. Unfortunately for us, the students of Room 208 now gather at a different site but I thought it would be nice to reminisce. Here is a play that I helped edit. It was written by the student, Tom. You could call it a silly exploration of what it means to feel excluded or you could just call it a masterpiece. Working with Tom was a pleasure, although it had its challenges, but then again, what doesn’t? I discovered that Tom could be pretty indecisive at time. The way we created the skit was by me presenting Tom with several different choices for the characters, plot, setting, etc. At times, Tom couldn’t decide between the choices, for example, if he wanted to write a skit about hot air balloons or playing ball, and there were even times when it felt like Tom was unmotivated to even make the decision. That was the hardest part because I occasionally felt like I was making the decisions and making the skit more about my ideas than his (and perhaps that was the reason why he was unmotivated originally—he may have felt it wasn’t his play). And of course, I was there as an editor, not a writer. However, despite those lapses in our creative process, which I often experience myself when creating a piece, Tom’s Play turned out to be truly Tom’s. I’m so glad we came today. You guys are my best friends. You guys are my best friends too. Yeah, Clown you’re my best friend. Hey Clown, I know a game we can play. But only two people can participate. Umm…I guess we could play. Duck, is that OK with you? Yeah, you guys can play. Hey, where did Duck go? It does to me. What if she’s lost? She’ll find her way back on her own. Let’s not waste time trying to find her. You know, I’ve been getting the feeling that you don’t like her. Why don’t you like her? What? She’s always talking to you. Yeah, but one time I saw her on the bus and she didn’t say hi to me. She probably didn’t notice you…Come on! We got to go find her. You and Bike made me feel left out! That’s only because you’re mean to me! How am I mean to you? You ignored me on the bus! That’s only because I thought you didn’t like me! Whoa, whoa, whoa! I think we have a little miscommunication going on here. Bike thinks that Duck doesn’t like her because she ignored her but Duck ignored her because she thinks Bike doesn’t like her. What do you think? Whose fault is it? You’re right, no one! Now that we’ve realized it’s no one’s fault, no one has to apologize, no one has to be mad, and everyone can play catch! A few months ago, Colin and I began an internship at Zest Books. Zest is a company that publishes non-fiction books geared toward teen audiences, on subjects ranging from how to make clothes out of old jeans to the memoir of a teenage girl diagnosed with leukemia. 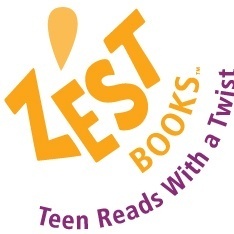 It’s an awesome company that accepts teen advisors (such as myself) to come in and work with a very nice and fashionable lady named Anne and read manuscripts that Zest is considering publishing, in order for them to get a teen’s perspective. We all sit around a table and drink tea and eat cookies and talk about what we think of people’s writing, which, at least to me, is a pretty ideal way to spend one’s time. The great thing is that we are actually allowed to say our honest opinions about the manuscripts, like “this cover is so weird why would this exist,” or “I really love the idea of this book, but the graphics are off-putting,” and it seems like they generally appreciate and value our advice. As a young person dipping my toes into the (very, very intimidating) writing industry, I can honestly say that the fact that the company and the adult-people running it are so lovely and interesting makes me want to be part of the publishing industry so much more.